Poe’s note: While I usually skip McFarlane toys these days due to their lack of articulation, I had to pick up the Snowman. He’s in the running with the Winter Warlock for my favorite holiday action figure. 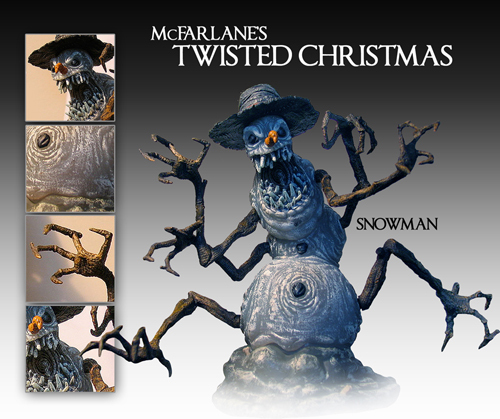 I don’t own any of the other Twisted Xmas figures, but this guy was a must-buy. Haven't picked any of these up yet, but McFarlane did a nice job on this wave. are these figures still avaliable? They've been warming the pegs on shelves at Newbury Comics by me since last year. Of course Mrs. Claus was nowhere to be seen. I've been tempted to pick up the Snowman for a while, I was just hoping they would have come down in price after last season.